In 1940 the MOD became a tenant of Largo House. Presumably, it was requisitioned without any financial incentive being paid to the owners. 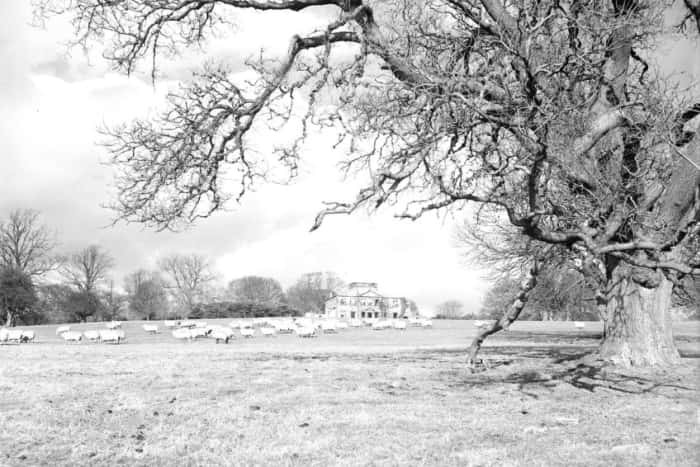 We have good reason to believe this photo was taken in 1939 prior to the MOD taking ownership but after the Durhams had vacated it, thus the sheep from a neighbouring farm are within its gardens and grounds. During World War 2, the army was given powers by the government to requisition and take over almost any building, even castles, that would have served war purposes. 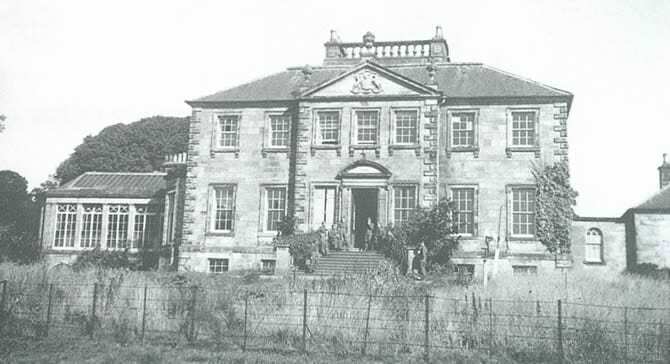 This is one of the very few photos in existence of the front of Largo House whilst the Polish Soldiers were stationed there. Although predominantly it was Polish soldiers who were at Largo House from 1941 onwards, others came along for training too such as the French, Norwegians, Belgians, Dutch and Czechs. Note the long grass in the photo. Many other photos show short, well maintained grass on which training was performed. Was this photo prior to the training i.e in 1941 shortly after the MOD took up residence there? I think so! As Largo house went active in June 1941 and is sometimes referred to as the HQ of 4th Polish Cadre Rifle Brigade it's almost certain that Largo House and also the parachute tower were initially designated for The 4th Polish Cadre Rifle Brigade . Later on, following General Sosabowski's renaming of the unit to "The 1st Independent Parachute Brigade", Largo House came to be known as the HQ of The 1st Independent Parachute Brigade. Parachute training by jumping from the parachute tower at Lundin Links. Those that did not pass pre-training had to stay at Largo House until they did pass. After pre-training at Largo House, the Polish paratroopers went to RAF Ringway for actual parachute jumps from aeroplanes. At the entrance of Largo House were grand gates (still there) with a Polish eagle on each pillar. At the entrance was a sign that said "If you are looking for death please come in for a while". Although the sign is long gone, the pillars, with one eagle, still remain. However due to the splitting of title deeds, the gatehouse now has the sole use of these entry gates, the original road to Largo House now buried under a field. Inside Largo House was the commandant's office, dining room and instructor rooms. A new recruit would typically enter the house, go upstairs to the commanders room and be interviewed. He would be told he would have a medical the following day and was then to immediately report to "Monkey Grove". A Religious Room Within Largo House? When Largo House was being used by the Polish troops, they had mass on a sunday. According to the book "Lata Zanikajacej Nadziei" by former parachuter Zbigniew S Siemaszko, on page 122 he refers to mass being held in the first room on the left on the ground floor. Interestingly, Zbigniew hated Largo House and refers to the pain of all the exercises they did in Malpy Gaj. He returned in the 1980s to take another look at it though!